The new Skoda Octavia – first shown to the public at the recent Paris Motor Show – has arrived in Ireland complete with new design features, better specifications, and a low-emissions, low-tax engine line-up. Promoted under the theme ‘Good Made Better’, the new Octavia preserves all that was good in its predecessor while featuring a number of new elements, including an increase in specifications and low-emission engine offerings across the range. While retaining the overall shape of the outgoing model, the new version benefits from a complete design transformation. Frontal changes include newly-shaped wraparound headlamps, a more robust radiator grille and a one-piece bumper. At the rear, a new tail lamp arrangement and a dynamic body-coloured bumper set-up with stylish reflectors on the lower section are the most noticeable features. Retained within the overall package is an abundance of luggage and interior space. Inside, a higher standard of materials and fabrics applies across the range. The dashboard has undergone a dramatic change with new controls and illumination, while decorative strips on the doors and central console have been redesigned. Engine wise, Skoda’s low CO2 diesels are retained. These include their Band-B, 1.9TDI, 105bhp (€156 per year road tax ) and Band-C, 2.0TDI 140bhp unit. Powerful low CO2 TSI petrol engines with 6-speed manual transmission include the 1.4TSI (Band-C €302 road tax ) and 1.8TSI (Band-D €447 road tax ) delivering 125bhp and 160bhp respectively. Band-C ratings with annual road tax of €302 are also achieved by the new 7-speed DSG automatics available in conjunction with these new TSI engines. Diesel automatic 6-Speed DSG transmissions and 4x4 drive systems also feature in the mix. With sales increasing year on year - more than 32,000 units have been purchased by customers in Ireland since the model was first launched here in 1998 - the new Octavia is destined to further strengthen Skoda’s presence in the mid-sized family car market. It will be sold in hatchback and combi estate versions in a choice of three equipment levels - Classic, Ambiente and Elegance. With 560 litres of luggage space, increasing to 1350 litres with the rear seats folded, the hatchback has one of the largest load capacities in its class. Adding to this sense of spaciousness, several additional storage areas are located throughout the cabin of the best selling Ambiente model, notably its large capacity door pockets and an area concealed from view beneath the passenger seat. Standard comfort items include a sound system with CD and iPod/mp3 connection facility, on board computer, electrically-operated and heated mirrors and an adjustable front centre armrest. The Octavia Combi could be seen as a viable SUV alternative with roof bars, a 4x4 option and packing 1,620l of luggage space with the seats folded down. In the Ambiente 1.9TDI (€22,375 ), features include Climatic air-conditioning as standard. In the upgraded Elegance diesel range (from €23,985 ), dual zone climate control, 15” alloy wheels, multi function leather steering wheel, rear parking sensors, cruise control, rain sensing wipers and Bluetooth phone preparation with voice recognition form part of the offering. At the top of the range, the prestigious Laurin & Klement, has full leather heated seats, a touch screen 6-CD Sound System with SD card port and xenon lights with AFS. All versions can be enhanced from an optional extras list that includes satellite navigation systems, alternative interiors, and alloy wheels. Volume models will be the hatchback in Ambiente and Elegance specification. 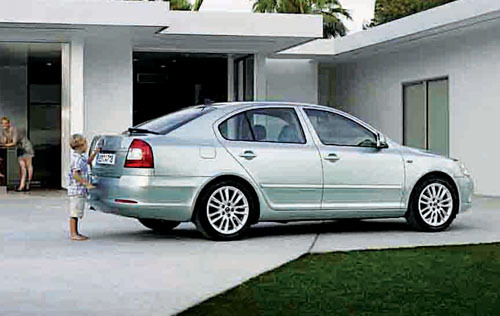 Prices start from €19,085 (ex works ) for the 1.4MPI Ambiente and €21,160 (ex works ) for the Octavia 1.4TSI Ambiente. Page generated in 0.1213 seconds.